The present Campus was first established as The Ganganatha Jha Research Institute in 1943. To perpetuate the memory of late Sir Ganganatha Jha the Institute was names after him. Sir Ganganatha Jha was a renowened Meemamsa scholar. The institute made it a point to encourage scholars working in the field of Meemamsa, the fond subject of Sir Ganganatha Jha. In that direction the work by A.S. Nataraja Ayyar, "Meemamsa Jurisprudence" (The sources of Hindu Law) was taken up for publication. It was published in 1952, more than half a century back. It was a sought after text by the members of the legal fratenity. It went out of print in 70s itself. Taking the necessity of the subject in view, its reprint is brought out now. Paying tributes to late Sir Ganganatha Jha we well remember the services of Dr. Umesh Mishra, the founder secretary of the Research Institute, A.S. Nataraja Ayyar, the author and Sri Har Govind Misra, who bore the cost of printing the text during those days. It is a source of great pleasure to me, as the Secretary of the Ganga- natha Jha Research Institute and also as the teacher under whose guidance the author of the present work has worked for more than five years, to place in the hands of the scholarly world the fi.tst part of "Mimamsa Jurisprudence and Mimamsa Rules of Interpretation." The Institute has been founded in the memory of the great Mimamsa scholar, the late Mahamahopadhyaya Dr. Sir Ganganatha Jha who was responsible inter alia for the revival of the study of the Mimamsa Sastra in northern India. It was, therefore, thought proper to award the first research scholarship of the Ganganatha Jha Research Institute for re- searches in Mimamsa. Ours being an All-India Research Institute it was considered not to restrict the award of the scholarship to any particular province. Thus Sri A. S. Nataraja Ayyar, M.A., M.L., was found a fit candidate for carrying on researches in Mimamsa under the Institute. He worked on the subject for more than three years and submitted his thesis for scrutiny. Dr. Sir S. Varadachariar, the external scrutinizer, was kind enough to go through the thesis and gave a good opinion on the work. The work could not be published earlier for want of sufficient funds available for the purpose. High class research works are not generally published for any financial gain. It is only to encourage serious scholars and help the seekers after knowledge that munificent patrons of learning and scholarship come forward to help the publication of such works. That serious scholarship has always found shelter under generous donors needs no mention. The Institute is very grateful to Sir Har Govind Misra of Kanpur who has kindly met the cost of printing the first part of the work. He is a Life-member of the Institute and by his action has shown the way to other members to advance the cause of Sanskrit learning in general and of the Institute in particular by such help. It is expected that Dr. Sir S. Varadachariar would be writing a detailed foreword as and when all the parts of the work are published. As to the worth and utility of the part now published I do not want to add anything myself but I leave it to the sound judgment of the impartial readers. With this brief foreword I conclude and I want only to express the hope that the rest of the work will be published soon and that generous donors will encourage the Institute with their patronage in this and other ways. The importance of" the Mimamsa Sastra in the study of the works on Dharma Sastra has been accepted from very early times. "In fact the principles of Mimamsa form the very background of our Dharma Sastra. All the rules of our Dharma Sastra have to be interpreted with the help of the Mimamsa Nyayas. So a Dharma Sastrin has necessarily to become a Mimamsaka first. Thus almost all the writers on Dharma Sastra from Manu down to the present day have been good Mimarnsakas also." (Page 5 Critical Bibliograpby, of Mimamsa by Mm. Dr. Omesha Mishra appended to Mm. Dr. Sir Ganganatha Jha's Purua mimamsa in its sources, 1942. Banaras Hindu University). Without being charged parochial, I, as a Maithila, should take pride in the contribution of the Maithilas inter alia to Mimamsa and Dharma Sastra. Some facts noted by Mm. Dr. Umesha Mishra in his Critical Bibliography would tend to make even Sabara, the Bhasyakara, who is regarded as the "Father of the Mimamsa Sastra" and Kumarila the greatest Mimamsa Vartikakara as Maithilas, Anyhow one is on sure ground in tracing Mandana Misra, who dispu.ted with the great Sankara, to be a Maithila. Tradition and research affirm that Vacaspati Misra I, the renowned author of the Bhamati on Sankara's Brahmra-sutra Bhasya, was an inhabitant of Mithila; his well known Mimamsa work is the comrnentary on VidbViveka known as Nyaya-Kanika. In the Tattra-Bindu, an independent work of his, Vacaspati Misra) discusses the processes of Sabda-bodha according to the various schools and he himself closely follows the viewpoint of the Bhatta School. Mm. Dr. Umesha. Mishra states that "in Mithila the study of Purva Mimamsa reached its zenith in the 14th and 15th centuries. During the reign of Rani Visvasavati Devi, the wife of RajaPadma Sinha, younger brother of Raja Siva Sinha, the patron of Vidyapati Thakkura, there was a big gathering of Pandits in the Catuscarana Yajna where as many as 1400 Mimamsakas alone were invited; and a list of the names of the scholars so invited has been recently unearthed from the private collection of a Pandita in Mithila." (vide p. 48 Dr. Umesha Mishra's Critical Bibliography). These and other facts await the future historian who would be writing a complete political, social, religious and cultural history of Mithila. Finally we come to Mm. Dr. Sir Ganganatha Jha who is accepted as the greatest Mimamsaka of modern times. He translated the Sabara Bhasya in three volumes for the Gaekwad Oriental Series. Kumarila's Sloka Vartika and Tantra Vartika were translated by him; and the Royal Asiatic Society of Bengal, Calcutta published the same in 1909 and 1924. Mm. Dr. Gopinath Kaviraj writing the foreword to the Tantra Vartika translation states that it has been the result of a laborious and sustained work carried on through over 25 years commencing from 1896. Mm. Ganganatha Jha wrote his D. Litt. 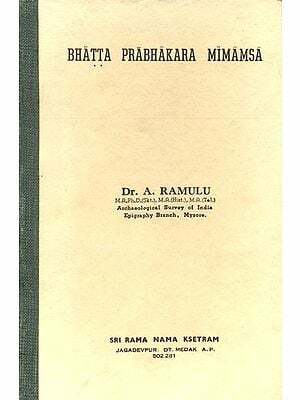 thesis in 1909 on "The Prabhakara School of Mimamsa" and this has now been superseded by his magnum opus "The Purva Mimamsa in its sources" published in 1942 by the Banaras Hindu University. In Sanskrit he has written a very easy and lucid 'commentary called mimamsa Mandana on the mimainsanukra-manika of Mandana Misra. The contributions of Sir Ganganatha Jha to the study of Hindu Law are equally great. He has edited Medhatithi's Bhasya on the Manu Smriti for the Royal Asiatic Society of Bengal; and translated the said Bhasya in 8 volumes for the Calcutta University. He translated Vachaspati Misra II's Vivada Chintamani for the Gaekwad Oriental Series. He wrote his" Hindu Law in its Sources" in two volumes. It would be unnecessary to instance how the world of scholar-ship has been benefited by the labours of Mm. Dr. Sir Ganganatha Jha. 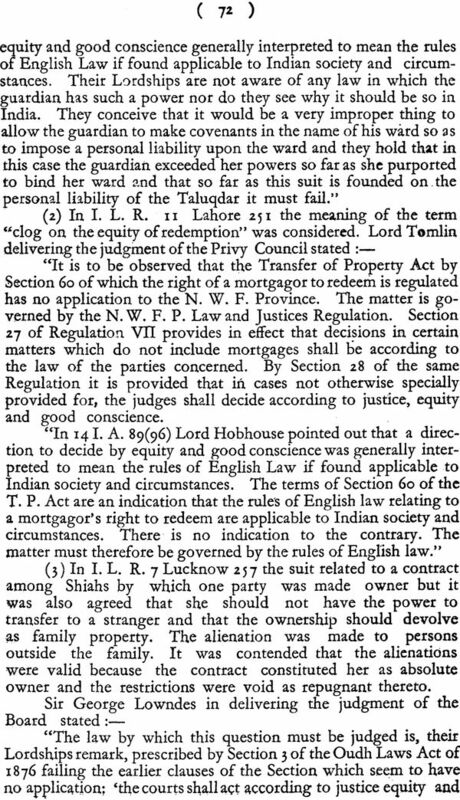 In the well-known case of the validity of the adoption of an only son decided by the Privy Council, the Mimamsa rule relating to texts containing a prohibition and reasons for the same came in for discussion. 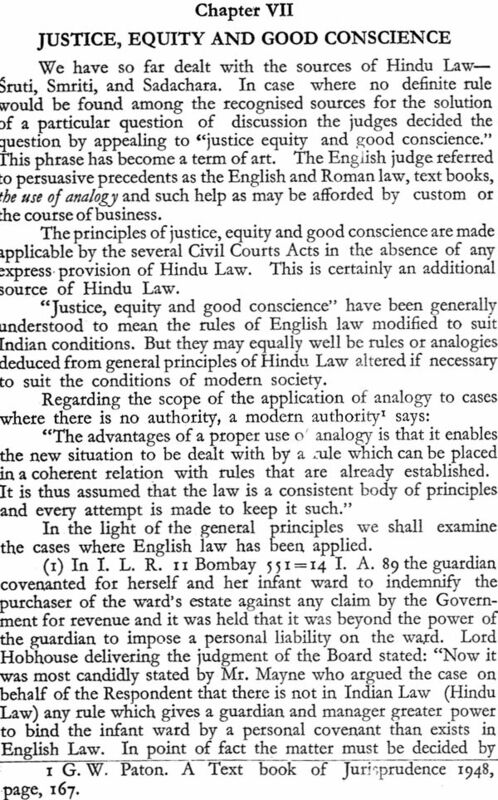 The meaning and discussion of the rule as given by Dr. Ganganatha Jha was accepted in the 10th edition of Mayne’s Hindu law revised by s. Srinivasa Ayyanagar, Advocate-general of madras who also warmly acknowledged his revision of Mayne being made easy by works like the Medhatithi Bhasya translation and “Hindu law in its Sources: of Dr. Sir Ganganatha Jha. The Mimamsa Sastra has for its definite purpose the investigation, examination, consideration, analysis and exposition of the doctrines underlying the Brahmana and the Mantra portions of the Vedas. 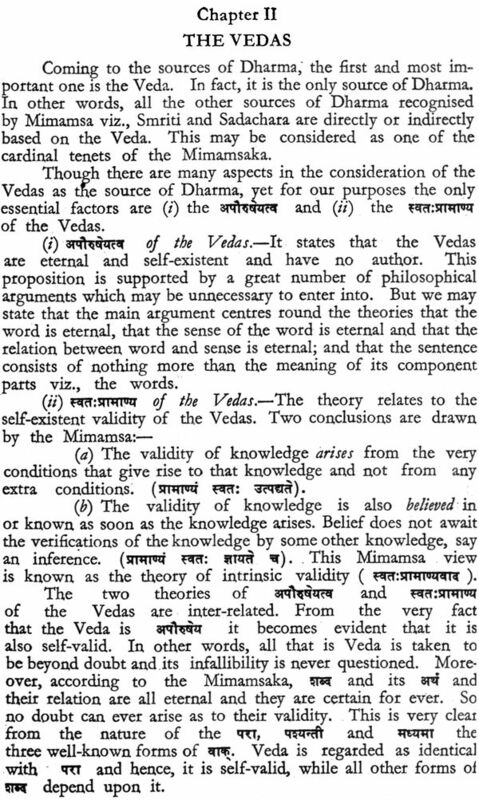 The Vedanta Sastra, similarly, deals with the Upanisadic portion of the Vedas. In this way, the contents of the entire Vedic Literature are summarised in two words- Dharma and Brahman Dharma is the subject matter of the Brahmana and Mantra portions of the Vedas in its essence and the subject matter of the Upanisadic portions. Jaimini systematised the exposition of Dharma and is the author of the Sutras styled as the Purva Mimamsa Sutras. Badarayana or Vyasa systematised the exposition of the Sutras known as the Vedanta Sutras. Internal evidence of the two Sutras establishes that Jaimini and Badarayana should have been the most illustrious of a long line of Acharyas and schools of thought working at both the systems. In course of time the Sastra founded by Jaimini was known as the Purva Mimamsa Sastra and that founded by Badarayana was known as the Vedanta Sastra, Further, internal evidence of the two Sutra works reveals Jairnini and Badarayana as contemporaries; and some special views of Jaimini (as for example, the one relating to the place and position of the Sannyasa Asrams according to Jaimini) are more to be found in the Badaray'ana Sutras and in the Sankara Bhasya. After the systematisation and exposition of the Purva Mimamsa Sastra in the form of Sutras, we come to the next great landmark in the Bhasya of Sabaraswamin, Then we come to the Vartika of Kumarila Bhatta an elder contemporary of Sankara and the commentary by Prabhakara. With these three names is associated the greatness of the Mimamsa Sastra, This 'period -may be styled as the creative or original period of the Mimafnsa Sastra. (i) The first dealing with the Adhikaranas of the Mimamsa Sastra, in their order. The chief works of this type are Parthasarathi Misra’s Sastra Dipika, Vidyaranya alias Madhavacharya's Nyaya-mala- Vistara and Khanda Deva's Bhatta Dipika. It would be necessary to give a bird's eye-view of the contents of this great Sastra. It deals with q1i as is cleat from its very first Sutra. The second sutras deals with the definition of Dharma. That which is indicated or defined by. The Vedic injunction as conducive to welfare is Dharma i.e., Dharma is what is enjoined in the Vedas and is conducive to desirable results. Dharma here stands in the wide sense of what may be styled as Duty. Jaimini has divided this Sastra into twelve Adhyayas and sixty padas and there are about a thousand. Adhikaranas which make the Sastra styled. The whole of the first Adhyaya is devoted to a criticial analysis of the Sources of Dharma and their reliability. By the time that Jaimini came to systematise the Sutras, two other sources of Dharma, besides the Vedas, came to be recognised as such viz., the Smriti and Sadachara; and the place and relation of the three sources, their rank, gradation and rules of acceptance in case of conflict were formulated in the first Adhyaya. Along with this, the definition of Dharma being indicated as and having been described by Sabara as that which enjoins one to. do the act, i.e., an injunction (positive and negative) it fell to the duty of the Mimamsakas to analyse the other types found in the Vedas as Mantras, Arthavadas and Namadheyas. 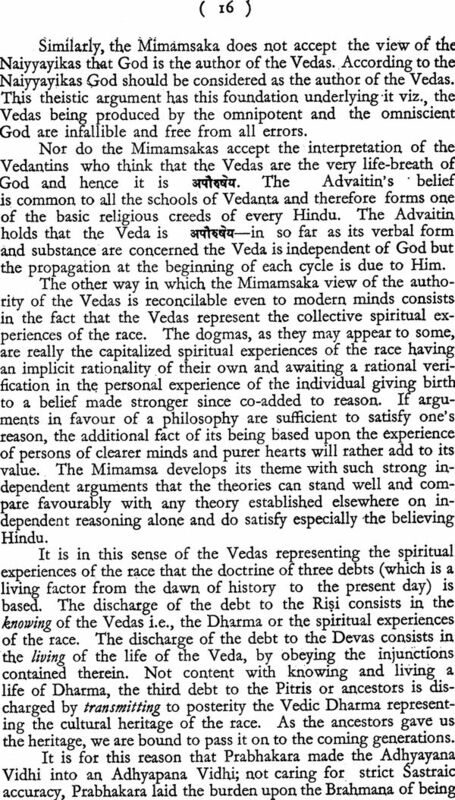 The meaning and scope of these three types in the Veda and their relation to the Vedas represented by the to be discussed.